t*rexes and tiaras: Party Party! Saturday also saw a trip to Leeds to watch the Northern Ballet's performance of Dracula, which was amazing. I saw one of their shows last year and was totally hooked, and from speaking to friends I gather all of their shows are the same - such modern and unique interpretations of classic storylines. I'd certainly recommend them if you're new to ballet. Although slightly tainted by the fact that one of my best friends didn't bother to join us, we spent a lovely morning in Leeds wandering around some of the shops, grabbing coffee in the Corn Exchange and laughing over lunch before the show. Afterwards, the rain meant we headed straight back homewards, but the weather back at Alex's was fine enough to take some photos. With Oscar helping, of course. My outfit for the day ended up being a bit of a mishmash of things. The cool weather meant I could continue to embrace patterned tights, as well as giving another new-to-me coat it's first outing. 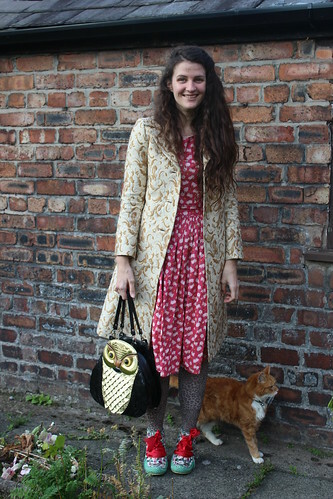 This Zara brocade coat was £8.50 via eBay and one of those things you're not sure whether to take a risk on or not. When it arrived I was glad I had. 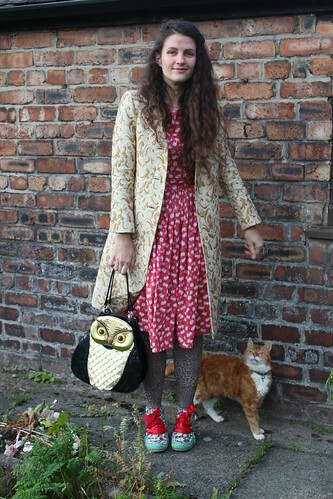 I've not used my owl bag very much and thought it would go pretty well with the colours in the coat - plus I've discovered it's big enough to carry my camera and a book as well as all of the essentials. I wore my Abigail's Party boots, which I'd been saving for something special since buying them back in June. It quite amused me to wear them with a party pigs print dress! It really was amazing, I loved it! I love that you are making your dresses. I have lots of patterns but just don't have the money for fabric I'm a bit bummed about that. Aww, that's a shame. I have to admit I think I spend more on fabric than clothes lately. Also I like to check charity shops for linen and sheets, which are more than enough for a dress or can be used for linings and are often cheaper than buying per metre. He is indeed, I think he helped! I couldn't resist this fabric, had to track it down when I saw it! That dress!!! I wish I had your skills - it is wonderful. Aw, thank you. It's just a case of following the instructions! That's a great outfit, Char. 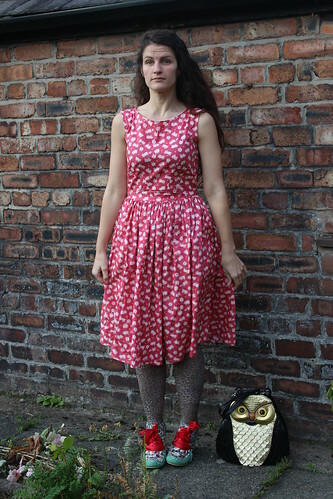 You always manage to pull off quirky too whereas I look like a refugee from a charity shop reject bin when I try it! 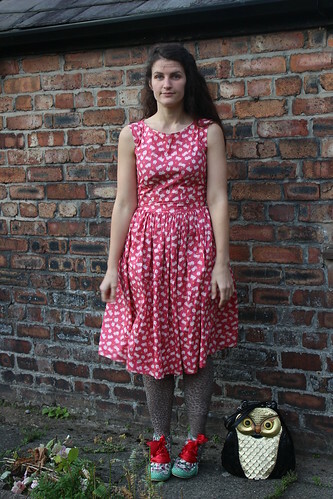 I'm always pretty sure that I look a bit "charity bin chic" rather than quirky, as well. But thank you! I love that I saw that brick wall and immediately thought 'she's at Alex's'! 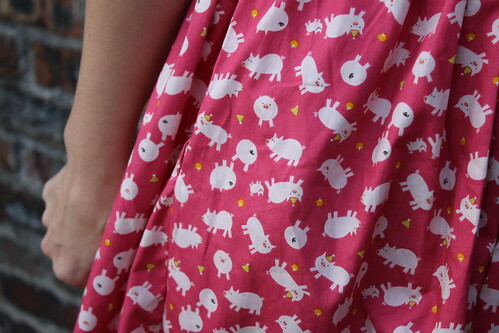 What cool fabric, little piggies dancing! 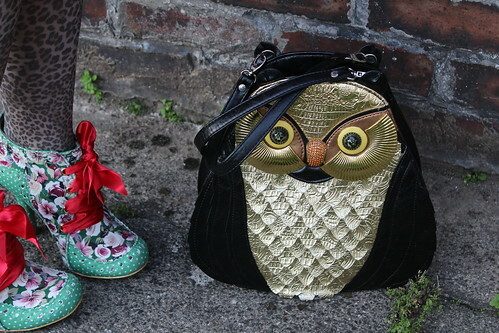 Bag is gorgeous as is the coat, fabulous. Haha, yes - I'd hoped to take some photos in Leeds but it was so rainy. You are such a talented dress maker, I wish I was as good as you with my sewing machine. You have such a unique style, so colourful and jolly, I just love it. I couldn't resist it when I saw it! What a super cute outfit- love the mix in patterns. Thank you, I'm never quite sure if my mixtures are going to work or not, but I was pleased with how this one turned out.